If you're in the field of software testing for a while then I'm sure you might have already come across a hoard of test management software by now. Some of today's best test management solutions are designed to organize, store and execute test cases, view test reports and to store historical data for these tests. In other words, a great test management tool provides features like managing test scripts, test planning, reporting, requirements tracking and easy out of the box collaboration with bug tracking tools. 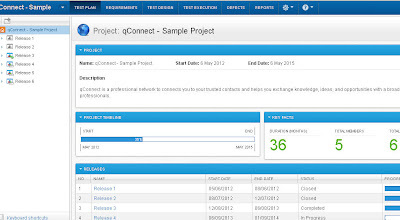 qTest, the new test management software from QASymphony is an exciting new addition to the list of such test management tools but has a lot of promise if you intend to empower your test teams. With software development increasingly moving towards Agile environments and with the focus shifting on fast delivery, test cycles in many organizations have shortened. Today, the test teams of an average organization have much less time to identify and document defects as compared to a decade earlier. But with all these change that Agile has brought upon us, one thing that has remain unchanged is the customer's expectations; expectations for bug-free software still remain high. Interestingly, qTest is designed to mesh seamlessly with a typical Agile development and provides a comprehensive set of easy-to-configure options for most of your testing needs. It enables you to easily enter project requirements, extrapolate test cases, run them, and store all the results for generation of future reports. Moreover with qTest, the cloud-based SaaS solution implies that everybody from your test team can access work from anyplace on any browser at any time, as long as they have internet connectivity. qTest additionally integrates with the qTrace screenshot capture and defect capture tool, which might submit bug reports directly into qTest to extend the testing team's productivity. Once you create a project and add your start and end date, and any other admins, you can begin to populate it. You’ll notice the following options in your navigation bar at the top – Test Plan, Requirements, Test Design, Test Execution, Defects, and Reports. These options are followed by a tools menu that permits you to configure user permissions, custom fields, external systems, notifications, and environments. The final option is the help guides, where you can also submit bugs or feature requests for the qTest tool itself. As you open each section you’ll realize that the navigation panel on the left hand side gets updated. This is where you'll be able to produce a hierarchy of project modules and their requirements, test cases, and defects. If you’ve already been employing a defect tracking solution, like JIRA or Bugzilla, or if you have test cases written in Excel sheets, then you'll be able to begin by importing data. That choice works each way. Also, you'll be able to export XLS files. To link up an external system you move to Defect Management within the tools menu and all new defects you enter in qTest are automatically exported and vice versa. qTest integrates with defect tracking and ALM providers like VersionOne, Fogbugz, JIRA, and Bugzilla as alternatives to the application's integral defect tracking tool. qTest additionally integrates with the qTrace screenshot capture and defect capture tool, which might submit bug reports directly into qTest to extend the testing team's productivity. You can extrapolate all kinds of essential data in here. Customize your test reports to display whatever you want, drill down to individual defects, or generate a top-level overview, filtered by date or field. In addition, qTest has the capability to manage requirements and you can have requirements associated seamlessly with test cases, which provide a fully Traceability matrix. Planning Test execution can be done by selecting scope of build, fixed defects or test cases itself. These are auto filled and comes with a one button submit defect at test execution sessions. Like numerous new releases today, it's a SaaS solution, based mostly within the cloud and it’s offered at $20 per month per user. The 30-day free trial provides you 5 licenses, thus you can check it out for yourself. qTest is a very comprehensive testing tool and it works hard to fit in with the ethos of Agile development. The automated fields, coupled records, and complete history are priceless for test teams. Not only is qTest serving to extend speed and potency, but also to supply transparency. Compared to existing solutions, at first glance, qTest ticks all the same boxes, but there are lots of little touches that you won’t find elsewhere. The end result is a smooth workflow and a dynamic, sturdy system that’s extraordinarily accessible. This is a competitively priced, scalable solution that any company may adopt instantly, with none hardware or package setup. Clearly QASymphony is targeted on empowering testers. Compared to ancient test management systems, that are complicated, expensive, and suffer from a steep learning curve, qTest might be the last testing tool you’ll ever need. qTest is clearly making an attempt to take care of the most common test team issues, by arming testers with a quick, intuitive tool capable of handling complicated projects. It’s designed to be simple to use, it’s totally customizable, it will plug into existing bug tracking software systems, and it creates a sequence of transparency that lays bare the whole life cycle of every defect. It is a tool that’s appealing to groups attempting to avoid wasting time by implementing agile testing. Nice article. Really a good read for cloud based testing. There are certain tools also available these days to test cloud apps like Selenium, TestingWhiz, and many more. I think these tools can help us making testing pretty easier.